"Camp in the NW, 110 miles SE of Wyndham. L to R Dodwell with portable transit Curlewis and 12inch theodolite. 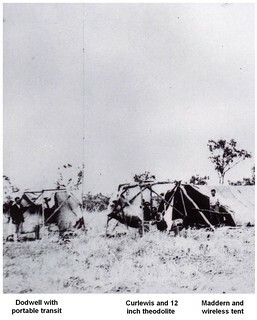 Maddern and wireless tent [...]." Photograph and original caption unknown [May be by MP Durack?] in collection of former SA Surveyor General, CM Hambidge. Hambidge Family Collection - Courtesy of former Surveyor General of SA, John Porter and Chris Jordan.